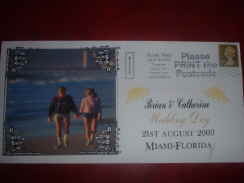 We offer a unique service to design a PERSONAL BIRTHDAY or WEDDING Postal cover that is dated on day/month of BIRTHDAY/WEDDING or chosen event! Also available for ANNIVERSARY COVERS. We are unable to offer this service IF event day takes place on a SUNDAY or a U.K Bank holiday. CONTACT US WITH YOUR DETAILS:- CLICK HERE PLEASE OR CLICK BASKET TO PURCHASE!